Wax is the coating of the future for wooden furniture. For example, in all new kindergartens only waxed furniture is used instead of the previously lacquered furniture. Old, lacquered furniture is usually reworked. With our sisal cord leather brush we provide our customers with an optimal tool for smoothing the wax. Our engineers and application technicians will be pleased to advise you on the use of sisal cord leather brushes in your processing by telephone or on site. The sisal cord leather brushes consist of 3 x 3 mm thick leather strips and sisal cords. The sisal cord and leather ratio of the sisal cord leather brush is 1:1. Both sisal cords and leather strips are attached to a cardboard flange. Aluminium flanges with freely selectable bore, which serve as a machine mounting, contribute to the fact that this tool can be mounted simply and quickly. Hot wax is smoothed using a sisal cord leather brush. The difficulty with the machining process is that the hot wax cools very quickly. By using a sisal cord leather brush and the heat generated in the process, the hot wax is liquefied again. The sisal in the brush distributes the hot wax applied to the workpiece. The leather in the brush brings the necessary shine to the workpiece. A distinction is made between hot wax and oil wax coatings. With both wax coatings, one or more polishing rings are used in synchronism to finish if a high gloss is to be achieved. To achieve a silky shine it is sufficient to use only a sisal cord leather brush. The hot wax becomes very hard after application. Therefore the hot wax is used for highly stressed parts (e.g. cupboards, furniture parts), while the oil wax is used for less stressed wooden parts (e.g. profile boards). The sisal cord leather brush is always used when the wax coating causes individual wood fibres to stand up and the surface is too rough. Soft types of wax require the use of a polishing disc during this process so that the surface is not attacked. 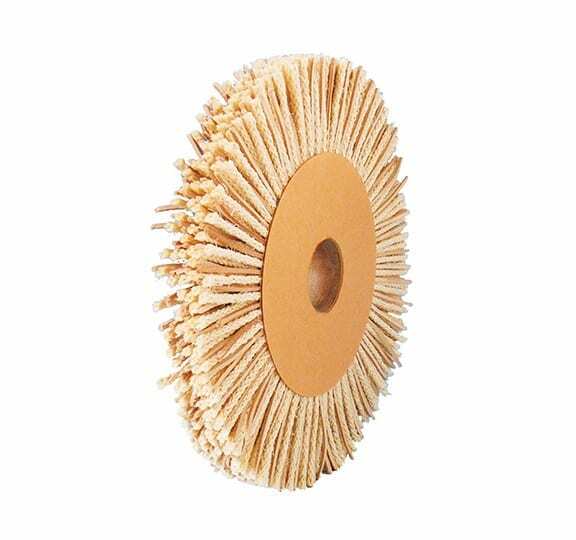 The brush can be cleaned using a backing covered with coarse abrasive cloth (grain 24). When cleaning, the brush should be used both in reverse and in synchronous mode.